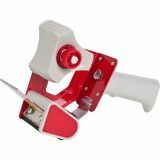 Sparco Packing Tape Dispenser - The pistol-grip dispenser holds 2" wide packaging tape with 3" core. Features an adjustable tension brake. Use Sparco 3750, 3710, 01530, 01613, 60042 and 60043 to refill.